Brookes alumnus and co-designer of the Olympic torch Jay Osgerby '89 has designed a £2 coin for the Royal Mint with his design partner Edward Barber. 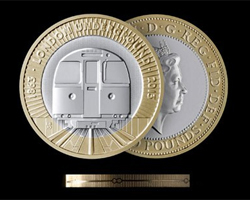 The coin commemorates the 150th anniversary of the London Underground and depicts the familiar image of a Tube train emerging from a tunnel. The outer ring of the coin is used graphically to suggest the tunnel walls. The coin’s edge bears an inscription representing an Underground line with a number of stations. The coin features the iconic London Underground New Johnston font. The train referenced is the 1967 Victoria Line train, chosen for its aesthetic simplicity and its wide recognition. A limited number of the coins are now in circulation, with more to follow later in the year.